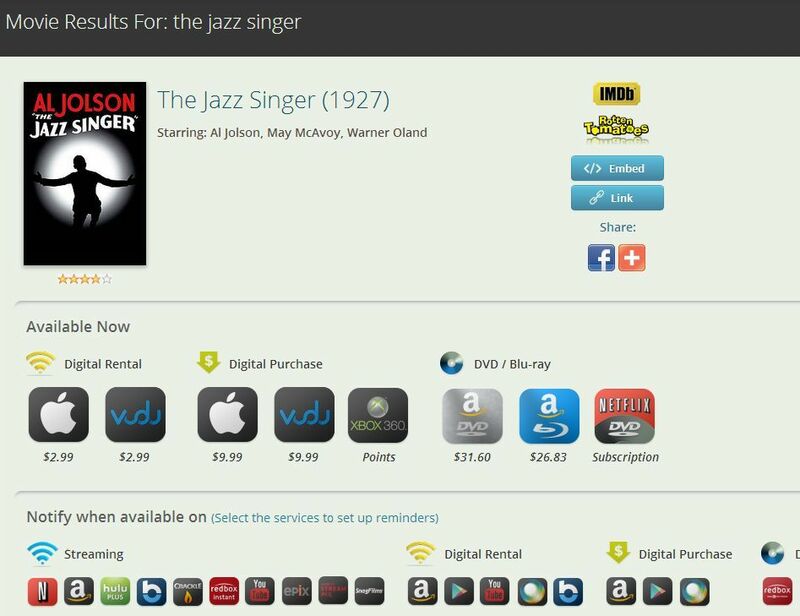 Recently my wife, Mrs. Hassle-Free PC, turned to me and said, "I want to watch 'The Jazz Singer.'" Ah, but it's not like we can just run up to the local video store and rent it. Our neighborhood Blockbuster closed its doors a couple years ago, meaning we had little choice but to investigate our online options. Needless to say, there are many: Amazon, Crackle, Hulu, iTunes, Netflix, Sony's Entertainment Network, Vudu, Xbox, Xfinity on Demand, and so on. It's great to have so many choices, but imagine the time it would take to connect with each and every one of those services to see which, if any, offered that movie. Thankfully, there's Can I Stream.It?, a search engine for movies and TV shows. Just type in the name of what you want to watch and CISI tells which streaming, rental, and/or purchase services have it. Thus, in addition to streaming services like Netflix and YouTube, CISI supports non-streaming options like Redbox and Netflix DVD subscription--just in case you prefer old-school media. Want to search on the run? CISI also offers free companion apps for Android, iOS, and Windows Phone. This is an insanely handy tool for anyone who wants to watch a particular movie or TV show and quickly find out what viewing options are available.